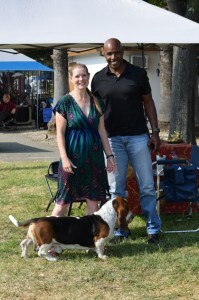 Canine Chronicle Photo of The Day: Barry Bonds Has A Show Dog! Thank you to Tim and Lorrie Martinez for sharing this fun photo of Lorrie, her Basset Hound, Buster, and Major League Baseball legend Barry Bonds at the Santa Rosa dog show last weekend. Barry Bonds actually was attending the dog show to watch his Miniature Schnauzer show with handler, Bill McFadden. You truly never know who you will run into at a dog show! If you have a photo you would like to share for Canine Chronicle’s photo of the day, email Cheslie at cheslie@caninechronicle.com.